Some of the best restaurants in Downtown Orlando will be getting together for the 14th annual Taste of Downtown on Wednesday, September 26th, 2012 from 5pm until 7:30pm. 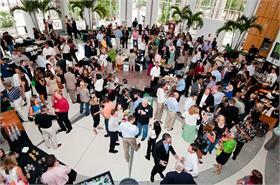 Hosted within the Disney Atrium at the main entrance of the Amway Center, participating restaurants and caterers for the 2012 event include Citrus Restaurant, Cityfish, HUE, Kres Chophouse, The Boheme at the Grand Bohemian, Levy Restaurants, Sweet Sweets and more. Tickets purchased in advance are $25 for members and $35 for non-members. Tickets purchased at the door are $35 for members and $45 for non-members. To purchase tickets, call 407.228.3891 or email buffie@downtownorlandopartnership.com. Click here to view other food events happening around Orlando throughout the year.